This Insight Technology LAM (Laser Aiming Module) incorporates a white light (flashlight), laser, and infrared targeting device. It is designed for special operations use. The handgun performs myriad missions for the special operator; hence, skill with the handgun is considered important in many special operations units. A good indication of this stress on handgun skill is the frequency with which special operators will be found at the better firearms training centers. Members of Delta, other Special Forces Units, DevGroup (aka SEAL Team Six), other SEAL teams, as well as visiting foreign units including the British Special Air Service and Special Boat Service are continuously rotating through training cycles at Gunsite, John Shaw's Mid South, Black Water, and other such facilities. In fact, I was at Black Water a couple of years ago when a group of SEALs were receiving handgun training with H&K's SOCOM pistol. In typical spec ops fashion, the SEALs were striving for perfection. As a result, any time one of the "froggies" missed a shot, he had to run carrying one of the steel plates from the range. I did not see many SEALs running, though those that did took it as their due for not performing their best. Among the various roles the handgun plays in special ops, one of the most basic is as secondary weapon. Special operators often operate behind enemy lines or other areas well away from normal supply channels. As a result, if their primary weapon, whether an M4 carbine, a shotgun, or an MP5 SMG becomes inoperable, they can't make a quick trip to the unit armorer for a replacement. And, bear in mind that hits to a weapon are not all that uncommon in combat since the weapon will often be in front of the body or protruding from cover. In other circumstances which might occur on a mission--helping to carry an injured team mate, for example--the handgun can be used more readily with one hand. 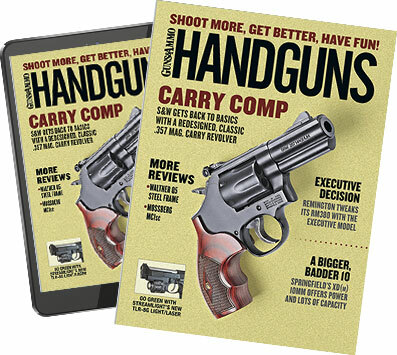 When the handgun is carried as a backup weapon, the operator will not normally carry a large supply of ammunition for it, though two spare magazines for a military high capacity auto grant somewhere in the 40- to 50-round range. Interestingly, one other old mission of the handgun became a new mission once again in Afghanistan where Special Forces operators were reminded that it is easier to fire a handgun from horseback than a rifle or carbine. Another role for the handgun with units such as the U.S. Army Special Forces or the Special Air Service, which often perform "hearts and minds" tasks while working with indigenous populations, is as an unobtrusive self defense arm. When Special Forces, SAS, or other medical or engineering specialists are treating villagers or helping them dig a well, it may not be convenient to have the rifle or carbine directly at hand. Experienced operators will have it as handy as possible, but still, the pistol on the hip or under the arm offers more propinquity. Special Forces operators must be familiar with a wide array of weapons. The CZ75 is one pistol widely used in the third world. The pistol, along with a good fighting/survival knife, carried on the belt in conjunction with compact survival items is the basis for many special operator's escape and evasion kit. Should the operator find himself in a situation where he must clandestinely infiltrate from behind enemy lines, this E&E kit is his final option. For special ops helicopter pilots such as those assigned to TF160 such a kit can be even more critical if downed behind enemy lines. Admittedly, spec ops chopper pilots normally have heavier weapons in their cockpits--at one time TF160 pilots flew with an MP5K strapped to their legs--but in a crash only the weapons worn on the person may stay with the pilot. In some special ops units, the handgun may serve the dual role of backup weapon and special purpose weapon. For example, the handgun might be carried with a suppressor or a light mounted so it can be employed in special circumstances. When searching caves in Afghanistan, a handgun with a light, laser, and/or suppressor might be invaluable. Of course the H&K Mark 23 SOCOM pistol is designed to have illuminators and/or a suppressor affixed. The suppressor may also serve the purpose of silent elimination of enemy personnel such as sentries--human or canine. The suppressor is used sometimes when special ops personnel carry out raids against drug processing sites or those sites where weapons of mass destruction may be stored or fabricated since the suppressor, especially if it is a "wet suppressor," will be less likely to ignite chemical fumes. When infiltrating a site through underground passages, particularly sewers which may be used in urban combat, this characteristic of the suppressor is invaluable to avoid igniting methane gas. For those special ops personnel who may carry out shipboard assaults or other operations in confined environments--once again Al Queda caves come to mind as well--the ability to use a suppressed handgun without unduly interfering with hearing or communication ability is quite useful. Among special operations units, combat swimmers such as the U.S. Navy SEALs often have a need for highly specialized handguns. Russian Naval Spetsnaz, for example, have been using specialized underwater pistols which fire darts for years while the SEALs, British SBS, Italian Incursuri, and other NATO combat swimmers have their own specialized handguns designed for eliminating an enemy underwater. Combat swimmer units also make use of at least one very common handgun as well. The Glock 17 is available for special operations usage in "Sub Aqua" configuration which allows it to be fired effectively underwater. The primary difference between the Sub Aqua Glock 17 and the standard model is quite small. A special two part firing pin retention cup designed to allow the firing pin to more efficiently function against water pressure is the primary component of the Glock Sub Aqua. Of course, because of their missions which often require them to exit the sea and kill silently on ships or ashore, combat swimmer units are generally equipped with some of the specialized suppressed weapons discussed previously. Often, specialized ammunition will be loaded for combat swimmer units. During the Vietnam era a special dummy round with an O-ring was designed for carry within the chamber of the "Hush Puppy" Smith & Wesson 9mm autos used by the SEALs. Most specialized ammunition, however, is just waterproofed to a higher standard. ormally be the submachine gun, hostage rescue teams also train extensively with handguns, both as secondary and primary weapons. In some cases, the handgun carried as a secondary weapon will have a light affixed so that it can be used should either the light on the primary weapon or the primary weapon itself fails. Often, the first member of an assault team through the door will use a handgun to allow him to more effectively employ an inspection mirror, SWAT Cam, or other surveillance device or to keep a hand free for opening doors. In many cases, too, members of special ops units will serve a tour on the hostage rescue team, then rotate to other duties. If, however, a hostage incident occurs when they are deployed they may still be tasked with an entry. In such cases, they may have their handguns available but not enough MP5s for an entire entry team. special operations troops for decades. Still other special ops units assault with handguns because their only other option is an assault rifle or carbine with full metal jacketed ammunition. The Tunisian national hostage rescue team, for example, used to assault with two Browning Hi-Powers, while some teams in former Russian republics still use the Stechkin machine pistol since they do not have SMGs other than the AKSU which fires 5.45mm rifle ammunition. Another application for the handgun in hostage rescue or other types of entries is operations in close quarters. When infiltrating through air conditioning systems, sewers, ship's passageways, aircraft luggage spaces or mechanical inspection areas, etc., the SMG is more likely to bang against obstructions and is more difficult to bring into action quickly. Many hostage rescue units practice rappelling and taking shots through windows while holding onto the ropes with one hand. Obviously, a handgun is the best choice in this situation. France's GIGN used to spend a lot of time practicing shots from the rappel. Members of military special ops units are sometimes pulled to serve on VIP protection teams as well. Members of Delta and Dev Group/SEAL Team Six have guarded high-ranking U.S. military personnel or Department of Defense officials, while members of the Special Air Service augment the protective teams of members of Great Britain's Royal Family when they are traveling to foreign venues where a higher threat is expected. On such protective assignments, the handgun will be the primary weapon, though heavier weapons will be available as well. Members of Great Britain's Special Boat Service sometimes draw duty traveling undercover aboard the Queen Elizabeth II to prevent hijackings. Once again, the easily concealed handgun is the best choice for these assignments. Many special ops units, but particularly combat swimmer units, employ suppressed weapons. Members of special operations units, who often have special language skills, may be asked to infiltrate foreign cities on surveillance or intelligence gathering missions against terrorist groups. Their armament will generally be one or more handguns which they can conceal beneath indigenous clothing. On such assignments and in other circumstances, members of special operations units need to be quite familiar with foreign weapons. Weapons specialists within the U.S. Army Special Forces must also have a strong familiarity with foreign weapons since they may be assigned training missions with indigenous forces. Although Special Forces weapons training will generally focus most heavily on assault rifles and submachine guns, substantial time is also spent in familiarity with handguns and in training techniques with the handgun. Among the handguns with which members of the Special Forces, SEALs, SAS, Spetsnaz, and other such units would be expected to have familiarity are Russian Makarov, Tokarev, Stechkin, PSM; Belgian Hi-Power and Five-seveN; Austrian Glock; German Heckler & Koch and Walther; Swiss SIG; Italian Beretta; Czech CZ75; and typical Smith & Wesson, Colt, and Manurhin revolvers. Many special ops units will have available a wide array of handguns, not just for training but for issuance in special circumstances. Two handguns mentioned in the previous paragraph illustrate another mission the handgun may be expected to perform when a carbine or rifle is not available. The Russian PSM and the Belgian Five-seveN are both designed with small caliber bullets which can punch through body armor. As a result, these weapons are quite effective against enemy personnel wearing body armor and ballistic helmets or against enemy VIPs who might be wearing a vest. Suppressed .22 and 9mm pistols are used extensively by special ops units. The 9mms require special subsonic ammunition to be effective. Psychologically, in some ways, handgun training for special ops personnel is akin to hand-to-hand combat training or blade training. Though the handgun can certainly be used at longer range than bare hands or the blade, it does not have the range of the rifle, carbine, or submachine gun. It does, however, presuppose that the special operator will close with the enemy and eliminate him at close quarters. Thus, just as hand-to-hand expertise and competence with the fighting knife breed an aggressive spirit and confidence, so does the ability to quickly engage and eliminate a target with the handgun. Though whatever its mission--confidence builder, special purpose weapon, backup, one-hand, or primary concealment arm--the handgun is an important part of the special operations armory. No special operator wants to take a pistol to a rifle fight, but if a suppressed pistol can help him avoid a rifle fight, he likes it just fine.